The final wording is not yet known. 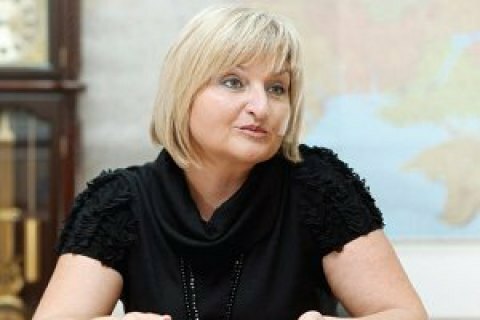 The president's representative in parliament, Iryna Lutsenko, has confirmed that the draft law on the reintegration of Donbas, announced in the early summer, will be submitted to parliament this week. "The draft law 'On the strategy of the restoration of the territorial integrity of Ukraine' - the liberation of Donbas - will be registered this week," Lutsenko said at the agenda-setting council. She did not elaborate on the details of this legislative initiative. On 13 June, the secretary of the National Security and Defence Council, Oleksandr Turchynov, said it was necessary to complete the antiterrorist operation and move on to a new format of protecting the country from a hybrid war with Russia. He said that the relevant draft law was in the making and would be submitted to the president and parliament soon. President Petro Poroshenko later said that the bill would address the reintegration of Donbas and list a series of measures aimed at bringing back the occupied territories. In particular, the bill must determine the legal status of the occupied territories. In July, it was reported that the draft law on the reintegration of Donbas defines Russia as the occupying state and gives green light to the use of the Ukrainian army. The final wording of the bill is still not known.